White Industries was established in 1960 as a jobbing repair shop servicing the local farming community. A part of the business produced aluminium and bronze castings for local spare parts supply companies. Since then, White Industries has grown significantly in size and market share. We have produced many vital components for Mack, Volvo & Leader trucks and for Austoft cane harvesters as well as Australian and overseas sugar mills. White Industries will continue to invest heavily in new equipment and methods to keep up to date with the rapid changes in foundry technology. You can see a more descriptive timeline of our history here. White Industries will be the foundry of choice within the Australian market providing on time, quality and cost effective castings. We are committed to providing the safest possible working environment for employees, contractors and visitors. Operational excellence will be the foundation of a continuous improvement culture that will encourage growth and acceptance to change and lead to a greater market share. 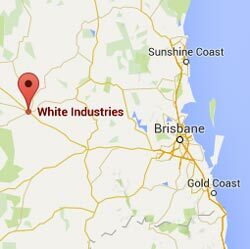 White Industries foundry was established in 1960 at Dalby in south east Queensland. Our large and modern manufacturing plant is a vibrant part of the rich and diversified economy of the Darling Downs region. Still owned and operated by the White Family, the foundry creates high quality precise work that can only come from a team who are truly passionate about their reputation. Over the years, with many regional foundries closing, White Industries have assembled and developed a great team of staff, with many senior and key members of the operational team coming from recent (being the last few years) industry closures. These include the Toowoomba Foundry, Austcast, Doug Slack Foundry, Procast, Rocklea Foundry, Bundaberg Metal Industries and Reliance Manufacturing. White Industries is an ISO Quality Endorsed company and operates a quality management program to comply with ISO standard 9001:2008. Our in-house “Production Process Control” data sheets (which are completed for each individual job) complement the requirements of ISO 9001:2008. These data sheets cater for the standard type of workflow, together with any job/customer specific requirements. As a national supplier of foundry castings, White Industries places a high priority on workplace safety with a safety monitoring program in place. A “QUIT” program encourages a healthy non-smoking workplace. The company strives to implement best practice environmental standards with natural gas fired furnaces and a modern sand reclamation plant. The foundry is an important end user of recycled ferrous and non-ferrous scrap metals.